For readers residing in Singapore, this dessert called Cheng Tng (清汤) which can be served either warm or cold is no stranger. In fact, it is one of the popular desserts served in food court or food centre (a.k.a. hawker centre). In particular to our warm country, a cold bowl of Cheng Tng (清汤) is always welcoming. There are many variations to the ingredients in a bowl of Cheng Tng (清汤). 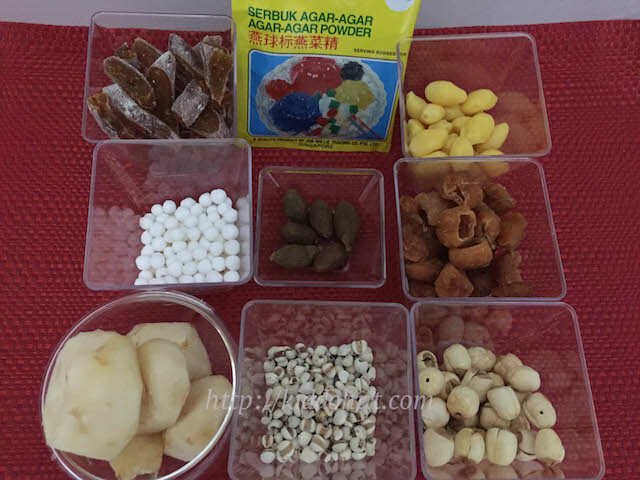 But, you never fail to find dried longan, Sago pearls, barley, gingko nuts, agar agar strips and Pang Da Hai (胖大海). 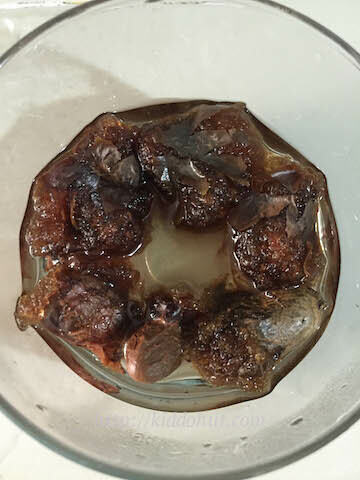 At times, you may get lotus seeds and/or coloured agar agar cubes from certain stalls. The stall I always frequent for the Cheng Tng (清汤) is located at Bedok North (in Singapore). Usually for stalls that sell Cheng Tng (清汤), they will sell other desserts as well. For this particular stall, they just sell Cheng Tng (清汤) and always in long queue. Although Singapore is a small island, it still takes me 20-30 minutes to drive there. If it is just for a bowl of Cheng Tng (清汤), I would only request my husband to make a trip during one of my pregnancy cravings. Trying to dissect the ingredients in their Cheng Tng (清汤), we noticed they have added dried persimmon and candied melon strip. That’s make their Cheng Tng (清汤) special, of course the soup itself is light and tasty. And I have long wanting to cook a bowl of Cheng Tng (清汤) with similar taste. Home-cooked food is always the best which allows me to adjust the sweetness and taste. 1. I have tried adding red dates to enhance the soup. But, somehow these two ingredients made the soup taste “heavier” than light and changed the fragrance. So, unless you love red dates immensely to add them. 2. For the gingko nuts and lotus seeds, I candied them. They tasted much better than just boiled. The taste warrants a little bit more effort here. 3. Do remove the green pith from the centre of the lotus seeds as it gives bitter taste. 4. It takes 1.5 hours to soften the lotus seeds through boiling. Include this time in your cooking. 5. For gingko nuts (白果/银杏/银果), you can use those unshelled ones or purchase the ready-peeled gingko nuts. Do remember to take out the “heart” in the gingko nut. Gingko nut has medical functions, whilst at the same time, it is toxic too especially for children. The toxicity cannot be destroyed from cooking. So it is advised to eat in limited quantity, the rule of thumb is 7. Also, some elderly would advise to remove the well-developed embryo inside the nut which is commonly known as the “heart” of gingko nut. If you are using the unshelled ones, you need to crack the gingko nuts, de-shell and peel the skin of the gingko nuts. Then boil it for at least 30 minutes. You can check out my recipe on Orh-Nee (Yam Paste) which uses Gingko nuts as one of the main ingredients too. 6. 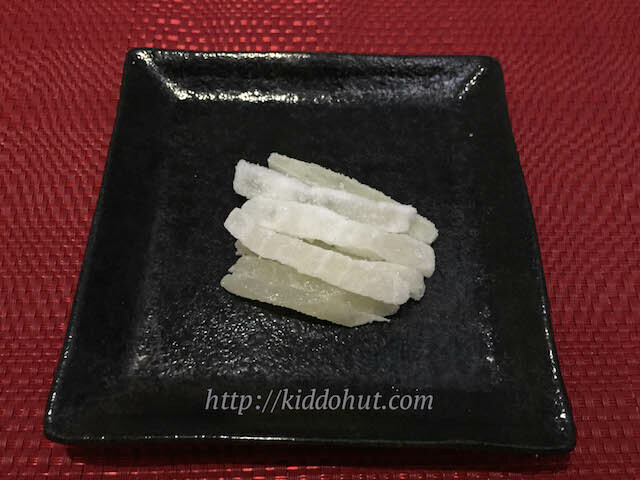 Pang Da Hai (胖大海) and Candied Melon Strips (冬瓜片) can be purchased from the Chinese medical halls. It is in seed form. So, what would be your ingredients for your Cheng Tng? 1. Stir the agar-agar powder in the water until dissolved. Bring to boil. 2. Split the agar-agar liquid into 3 portions and add food colouring. Leave in fridge to set. After set, cut into cubes. 3. Boil Lotus seeds in medium-low heat for 1.5 hours or until soft. Coat it with the Demerara Sugars and set aside for at least an hour. 4. (if using unshelled gingko nuts) Crack the gingko nuts, de-shell and peel the skin of the gingko nuts. 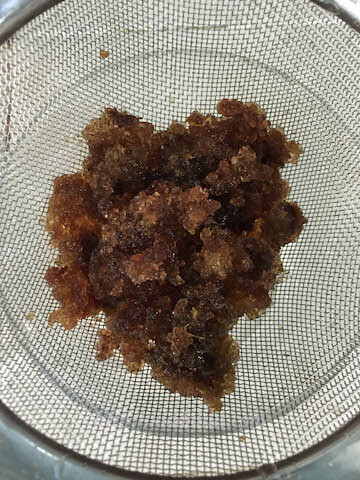 Then boil it in 500ml of water with 200g of brown sugar slab for at least 30 minutes. Leave the cooked gingko nuts to soak in the syrup water for at least an hour. (if using vacuum packed gingko nuts) Boil it in 200ml of water with 100g of brown sugar slab for 10 minutes. Leave the cooked gingko nuts to soak in the syrup water for at least an hour. 5. Cook the Sago pearls in boiling water for 15-20 minutes. Leave the pot covered for another 15 minutes. Drain and rinse with running water using sieve. Set aside. 6. Soak Pang Da Hai in hot water. When the seeds split open, drain it and remove the outer shells. Set aside. 7. Bring 1.8litre of water to boil. Add barley and simmer over medium-low heat for 15 minutes. 8. Add the dried longan and continue to simmer for another 15 minutes. 9. Add honey rock sugar to taste. Off heat. Scoop out the dried longan and barley. Set aside for serving. 10. 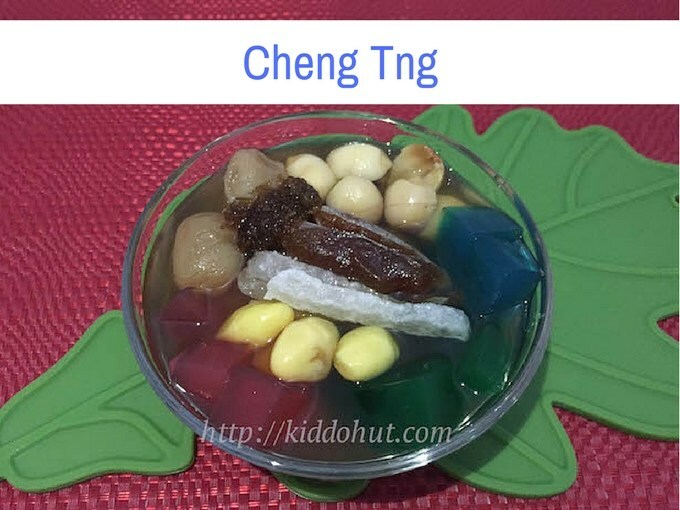 Arrange the candied gingko nuts, lotus seeds, cubed agar-agar, Sago pearls, Pang Da Hai, dried persimmon strips, candied winter melon strips, dried longan and barley in a bowl. Add the soup. Serve.